Obituary – Daniels, Edna E (Shultz) « Perry High School Alumni Association, Inc.
﻿Life-long area resident Edna Daniels, 80, 1415 Kaw street, died at 3:10 p.m. Saturday at Perry Memorial hospital. Funeral will be at 10 a.m. Tuesday at the First United Methodist church. Rev. Bill Stacy, pastor, will officiate. Burial will be at Grace Hill cemetery under direction of Brown Funeral home. Memorials may be made to the First United Methodist church. Mrs. Daniels was the daughter of Milton and Nellie May Schultz. She was born April 9,1907, in Noble county. 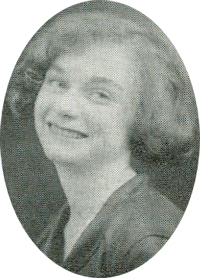 She was a 1925 graduate of Perry high school. She and Harold “Hump” Daniels were married at Perry, Oct. 23, 1946. Mrs. Daniels was a 35-year employee of Oklahoma Natural Gas Co. She was a member of the First United Methodist church and the United Methodist Women. Mrs. Daniels was a charter member of the Perry chapter of Business and Professional Women which later became Perry Business Women. Survivors include one nephew, John Schultz, Sedalia, Mo. ; and two great-nieces.